Every West Virginia LLC owner should have an operating agreement in place in order to protect the operations of their business. 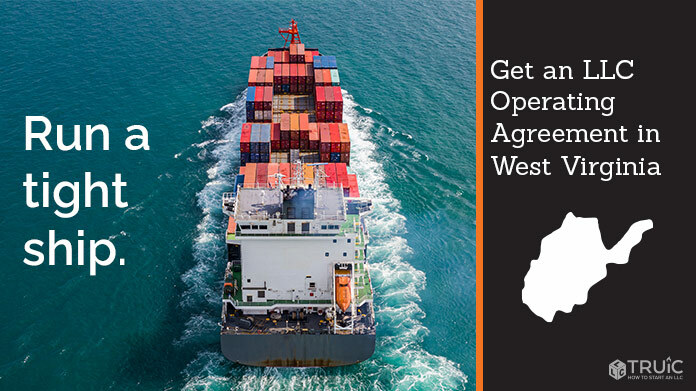 To get a free operating agreement for your West Virginia LLC, you can use our sample templates or customizable tool. An operating agreement is a legal document that outlines the ownership structure and operating procedures of an LLC. Whether you are starting a single-member or multi-member. LLC, your operating agreement should address all of the topics below. Some of these stipulations will not have much bearing on the actual operations of a single-member LLC, but are still important to include for the sake of legal formality. Organization: When the LLC was officially formed, who its members are, and how ownership is divided. Multi-member LLCs may utilize an equal ownership structure or assign various members different “units” of ownership. Management & Voting: Whether the LLC will be managed by its members or by an appointed manager (learn more), and how members will go about voting on business matters. Typically, each member has one vote, but you may wish to give some members more voting power than others. Capital Contributions: The amount of money each member has invested in the business. This is also where you should establish an approach to raising additional funds in the future. Distributions: How profits and losses will be divided among the members. The most common option is to distribute profits evenly. If you want them divided a different way, this should be detailed in your operating agreement. Changes to Membership Structure: How roles and ownership will be transferred in the event that a member leaves the company. It’s essential to lay out the process for buying out and/or replacing a member in the LLC’s governing document. Dissolution: If at some point all the members of your LLC decide you no longer wish to conduct business, you should officially dissolve it. Outlining the hypothetical process of dissolving your business is an important aspect of your operating agreement. WHY SHOULD I HAVE AN OPERATING AGREEMENT? It’s recommended by the state. According to WV Corporations Code Chapter 31B Sec. 1-103, all members of a West Virginia LLC may enter into an operating agreement to regulate the internal affairs of the company. It'll prevent conflict among your business partners. If you're starting a multi-member LLC, having an operating agreement will prevent misunderstandings amongst your team by setting clear expectations about each partner's role and responsibilities. It helps preserve your limited liability status. If you're the sole owner of a single-member LLC in West Virginia, having an operating agreement will help to ensure your limited liability status is upheld by court officials, and add to your business' credibility as a whole. We teamed up with a business attorney to develop free operating agreement templates and a customizable Operating Agreement Tool. Simply sign up for a free business center account to get started. Single-Member Operating Agreement: For LLCs formed by a single individual. Multi-Member Operating Agreement (Member-Managed): For LLCs formed by multiple members who wish to jointly manage the company. Multi-Member Operating Agreement (Manager-Managed): For LLCs formed by multiple members who wish to appoint one or more managers to handle the daily affairs of the company. The Operating Agreement Tool makes it easy to create a customized operating agreement for your business by answering a few simple questions. Create a free account with our Business Center to access operating agreement templates and dozens of other useful guides and resources for your business. INSTRUCTIONS: Create your business center account. After logging in, scroll down to "TOOLS" and select "Free Legal Forms". Keep in mind that these operating agreements are meant for reference and should be reviewed by a lawyer. Yes. Although you won’t file this document with the state, having an operating agreement in place is the best way to maintain control of your West Virginia LLC in the face of change or chaos. When should I create my operating agreement? While it's a good idea to create an operating agreement before filing your Articles of Organization, the state does not discourage LLCs from waiting until the formation process is complete. It's worth noting that some banks require you to submit an operating agreement in order to open a business bank account. No. Operating agreements are to be retained by the LLC members. There is no need to submit this document with the WV Secretary of State.